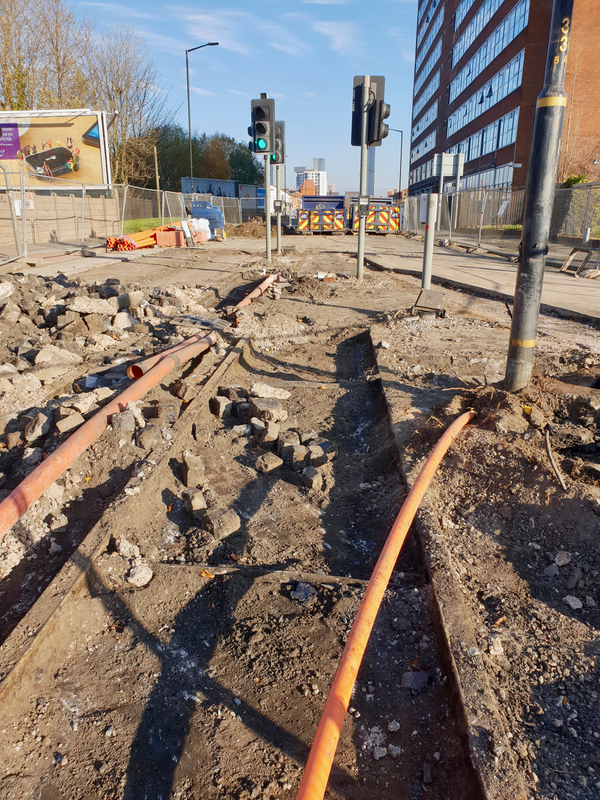 Work on the Stretford Cycleway isn’t just limited to what’s been carried out on Talbot Road and Stretford Road. There’s a number of upcoming schemes which will enhance what’s been done, to make the route safer and more attractive to use. Before the paint was even dry on Talbot Road and Stretford Road, work had already started at the Westpoint junction. Westpoint was never part of the original Stretford Cycleway scheme. It had come about as there was leftover funds available out of the CCAG2 pot, due to other schemes not going ahead or being scaled back. Anyone who’s ridden from Talbot Road onto Stretford Road will know why improvements are needed. Turning right onto Talbot Road requires getting across a lane of traffic and into the suicide cycle lane. This can be pretty unpleasant, especially when there’s a lot of traffic racing from the lights. Plans for Westpoint include a new protected cycleway on the inbound side, plus a two stage right turn onto Stretford Road. These should certainly help make riding from Talbot Road to Stretford Road much more pleasant and safe. Though it does feel a bit of a wasted opportunity. This junction is a hangover from when this road was the A56 and the main route into Manchester. Some 20 or years ago, this changed when the Bridgewater Way dual carriageway was built. There was a real opportunity to re-purpose the space here, change the alignment to prioritise the route between Talbot Road and Stretford Road and give more space over to walking and cycling. While what we’re getting is an improvement, the cycleway could have been wider and less awkward. On the outbound side, there isn’t a great deal of difference to what was there already. It’s been tidied up a little, but that’s about it. Again, there was opportunity to widen the cycleway and improve the path across the Carver Street junction, which is now a little problematic. Why there’s give way markings on the cycleway still, I don’t know. 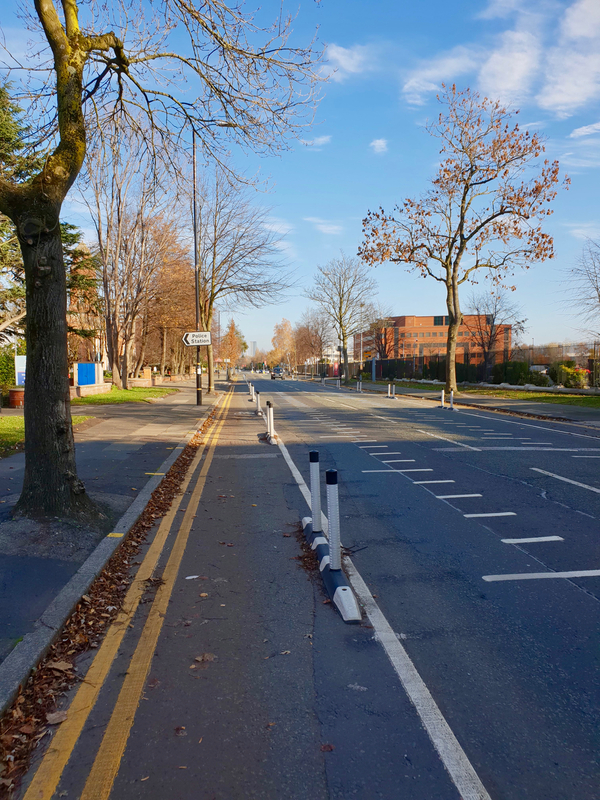 Overall though, the work at Westpoint will be a welcome improvement, which will mean one less barrier to people cycling along the Stretford Cycleway. Another section that was partially omitted from the original Stretford Cycleway scheme is the part of Talbot Road between White City Way and Seymour Grove. While Wand Orcas have been placed on the outbound side, there’s none on the inbound side. The reason for this is the lack of width to accommodate a cycleway and Wand Orcas. Right now, the section between White City Way and Boyer Street is just far too narrow. Given the limited budget for the initial scheme and the lack of political will at the time, nothing could be done and so it was just left as it was. Fortunately, a proposal for improvements here were put forward as part of the first set of Beelines schemes. Though with a budget of just £250,000, the scope of work will be pretty limited. Indeed, initial descriptions of the work carried out talked about shared footways and cycleways, divided by a painted line. Not really what I was expecting we’d be getting from Beelines on one of the key commuting routes. We’re yet to see any detailed proposals published for the upgrade here, but given the budget and space constraints, I’m expecting it to be pretty compromised. This section of road carries 4 traffic lanes, plus cycleways and footways. There just isn’t enough space to accommodate all of that. The obvious solution is the removal of a traffic lane. But I’m doubtful that any of the parties involved would go for that, given this section of road facilitates access between White City Way and Seymour Grove. Another option is to remove through traffic from this section of Talbot Road and reroute the traffic from Seymour Grove onto Chester Road. Maybe even between the Bingo Hall and the old fireplace shop? Another significant problem is the White City Way junction itself, particularly when travelling inbound. You have to be pretty vigilant cycling through here at peak times, with the suicide cycle lane between the left and straight traffic lanes. Drivers just don’t look at they pull across your path, so you have to approach pretty cautiously. My original understanding was that this was out of scope for the Beelines scheme, though that might not be the case. If it is in scope and if this junction is going to be tackled properly, they’ll need to find more than £250,000. A whole lot more. The obvious answer to me is to switch round the cycleway and left lane, then have separate phases for left turning traffic and cycles going straight. This seems to be what’s proposed for the Brooks’s Bar junction on the Chorlton Cycleway, and I think it could work here too. 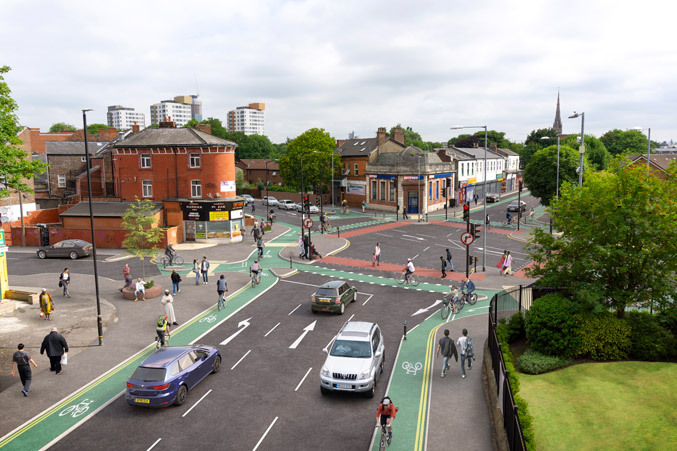 Proposed Brook’s Bar junction on the Chorlton Cycleway, a model for what could be done at the White City Way junction? If switching the lanes is too costly and difficult to do, how about just removing the left lane completely and turning it into the cycleway? I’d argue that the Chester Road/Talbot Road junction is easily the most significant barrier to people using the Stretford Cycleway. Having to negotiate 3 busy lanes of speeding traffic, while riding over a bridge to turn right onto Talbot Road is not for the faint-hearted. If you make it into the right turn lane, you then have to contend with close passes as motor vehicles merge from two lanes next to you. Given this is a route I do often. I’ve found alternatives that mean I don’t have to attempt the right turn, usually by carrying on further and crossing at the informal crossing closer to Talbot Road. While this works for me, it’s not a proper solution. The same goes for people walking, there’s no easy way across this junction if you’re on foot either. Just for your benefit, I didn’t do my usual route and rode across the 3 lanes in the following video. Though I wasn’t starting at the bottom of the bridge and there was only Sunday morning traffic to contend with. 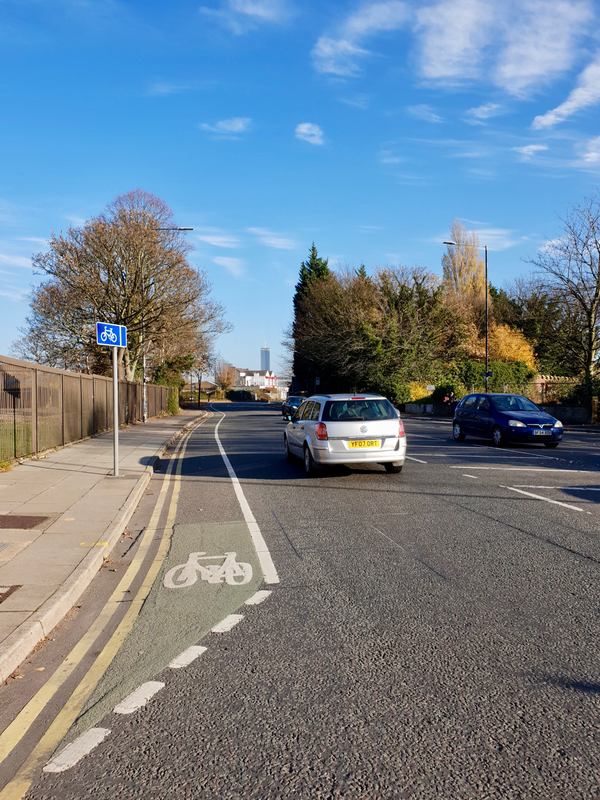 In the second set of Beelines schemes, bids were included to improve the Chester Road and Great Stone Road junctions to “further enhance the cycle facilities currently under construction on Talbot Road”. The bid is to include “dedicated crossings for people travelling on foot and by bike”, which is very good news. 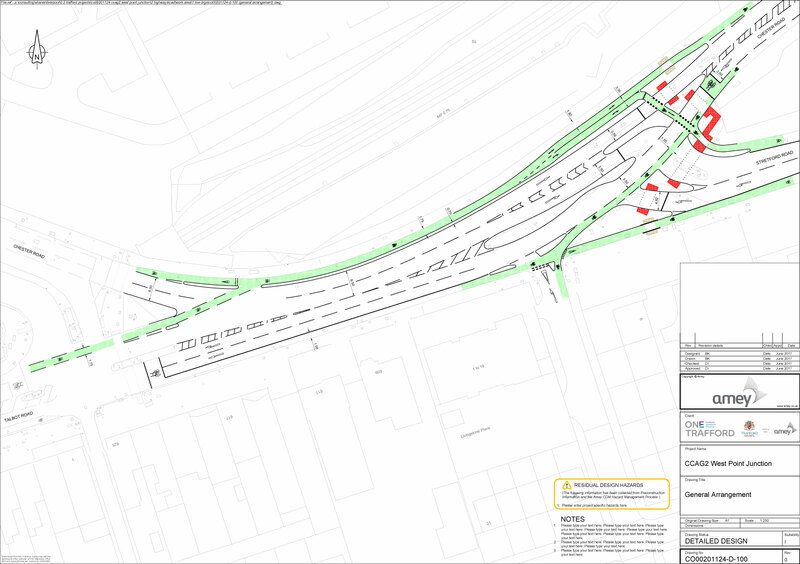 As with the other Beelines scheme, nothing has been published as yet for the Chester Road junction. The most sensible option would be to implement something like the alternative route I use, putting in proper signalled crossings for walking and cycling. This should include improvements to the route over the bridge and across the entrance to Longford Road, ideally with a continuous footway/cycleway. Great Stone Road has its own set of problems. The cycleways approaching the junction are narrow and unprotected and there’s a real lack of safe crossings for people on foot. 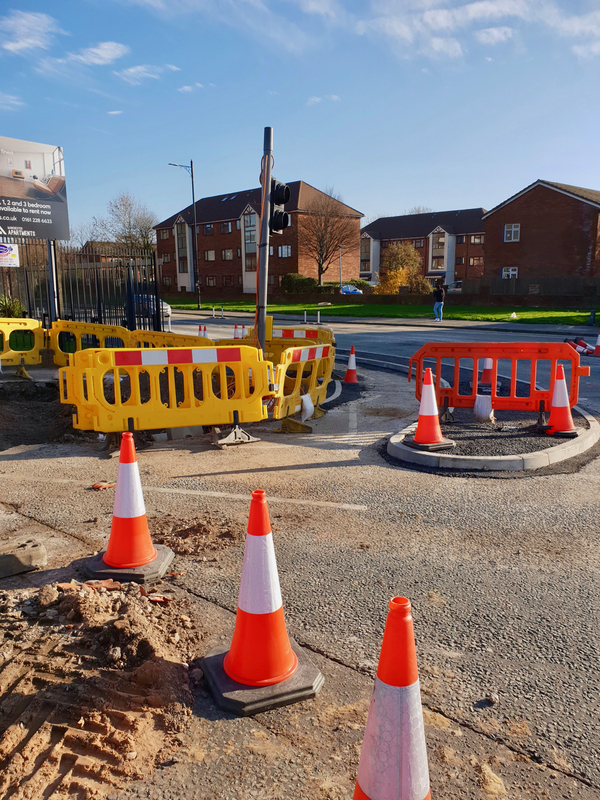 Given its location next to Stretford High School, Trafford College and Gorse Hill Park, it’s surprising nothing has been done about the junction before. But Trafford is littered with awful junctions that prioritise motors above everyone else. Again, not much is known at this stage about what improvements will be carried out, but there has been talk of pedestrians getting their own phase and diagonal crossings. 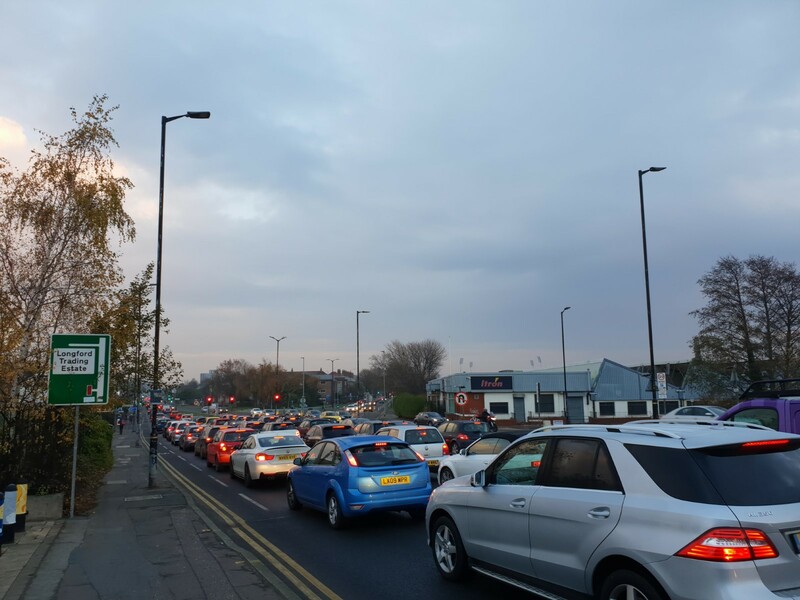 The proposed Civic Quarter Masterplan has the potential to significantly impact the Stretford Cycleway, either for good or bad, depending on what’s implemented. 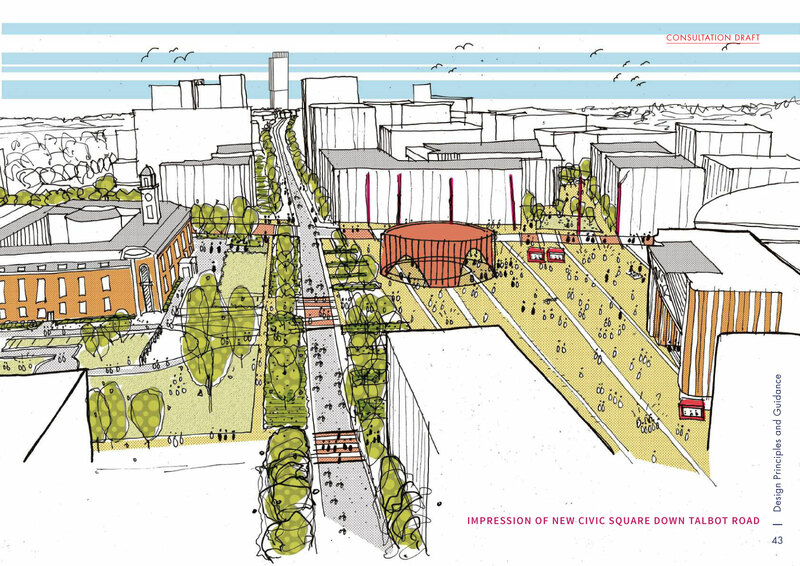 Civic Square proposals at the town hall, with cycleways removed? You can read more about the proposals in my post on the Civic Quarter Masterplan. Though in summary, it appears to include the removal of through traffic at the town hall and cricket ground and in the introduction of a ‘Wellbeing Route’. Are we about to lose this protected space for cycling as part of the Civic Quarter scheme? Taken at face value, this could be promising, but the proposals are vague and there’s a lack of detail. In the worst case, it could include the removal of the newly installed cycleway and bikes forced to share a limited space with motor vehicles. Not good. Now that the original scheme is pretty much complete, you really notice when you reach the Manchester border, where the protection ends and the stress returns. This is up there with the Chester Road junction in terms of barriers to use. Prior to Beelines, this kind of situation was inevitable as councils implemented their own schemes independently of each other. With attempts to join up schemes across local authority boundaries having limited success. Having a cycling and walking commissioner who reports to the Greater Manchester Mayor should we’re able to have a much more joined up network. That’s very much the intention with Beelines, though we’re still reliant on councils bidding for Beelines funding, so it’s not guaranteed. Proposals for the Chorlton Cycleway include the linking up of the Stretford Cycleway with the Chorlton Road section of the route. This will enable people to continue towards the city centre on a protected route. While the link to the Chorlton Cycleway is good news, it’s not enough. Many users of the Stretford Cycleway want to continue along Stretford Road into Hulme and up to the University/Oxford Road area. We need to see a commitment to deliver this route to fully realise the benefit of the Stretford Cycleway.